The word “orzo” in italian means “barley”. Orzo pasta (pasta shaped like rice or grain) is very versatile. It can be boiled, baked, used as a filler in casseroles or when making stuffed peppers. Also, great in soups. The best orzo is made of durum semolina flour and is very popular in Italy, Greece and other Mediterranean and Middle Eastern Countries. 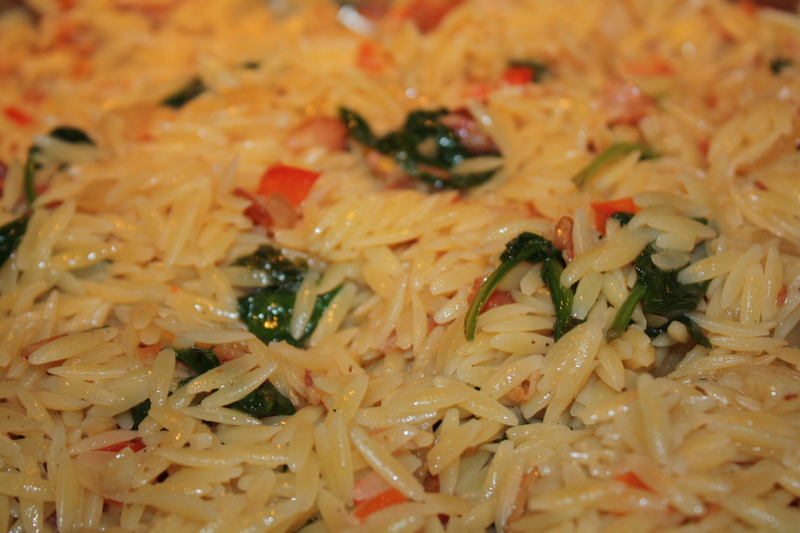 I like this version of orzo pasta because it is very savory and not very heavy. Add as much spinach as you can and by all means… it has to be fresh! Serve alone or as a side dish. 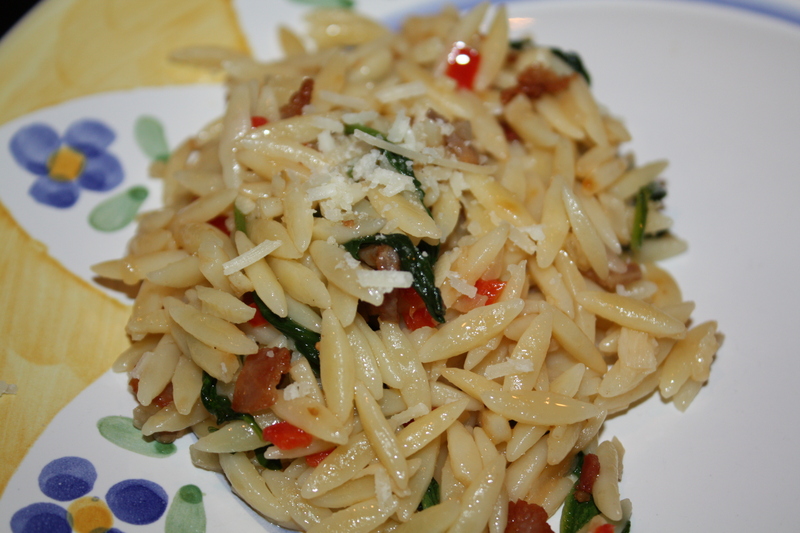 Orzo with Spinach is also great as a cold salad. If you are going to serve it as a salad, drizzle with a little extra virgin olive oil before serving so that it looks shiny and fresh. 1. In a deep large skillet, heat extra virgin olive oil in medium. 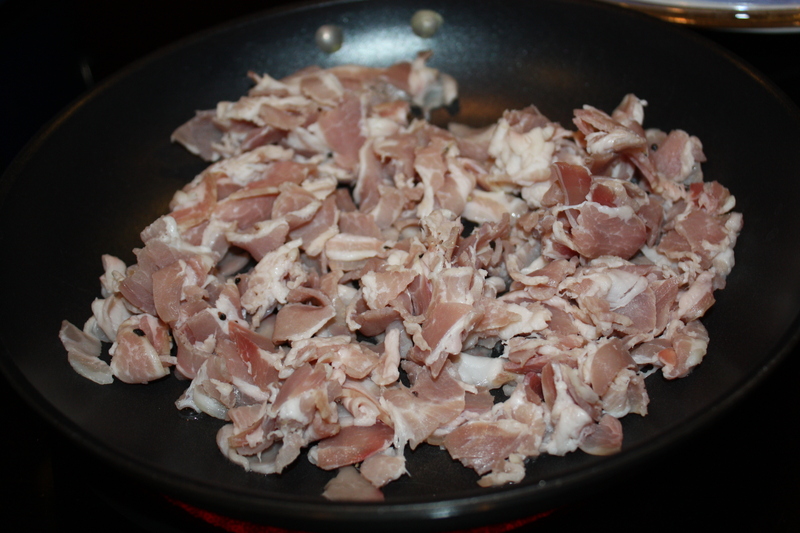 Add pancetta and saute for about 5 minutes until pieces begin to cook. You don’t want pancetta to be crispy or burned. Stir occasionally. 2. 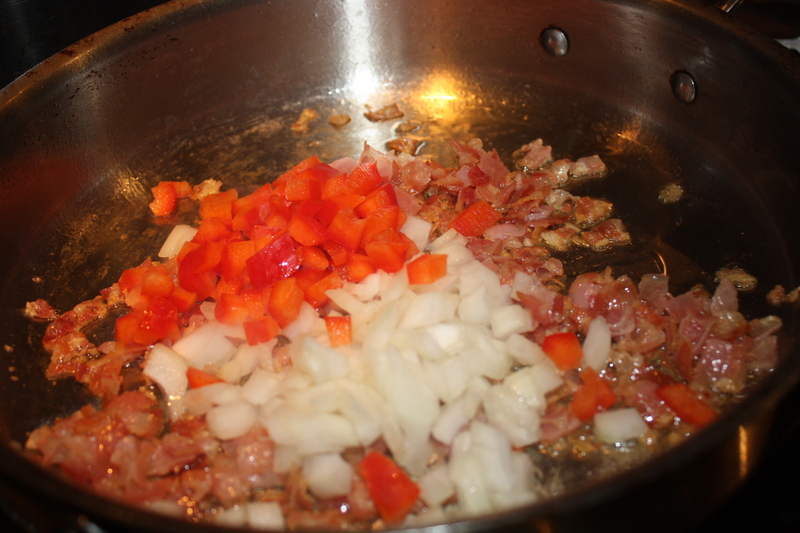 Add onions and red peppers and saute for about 2 minutes. 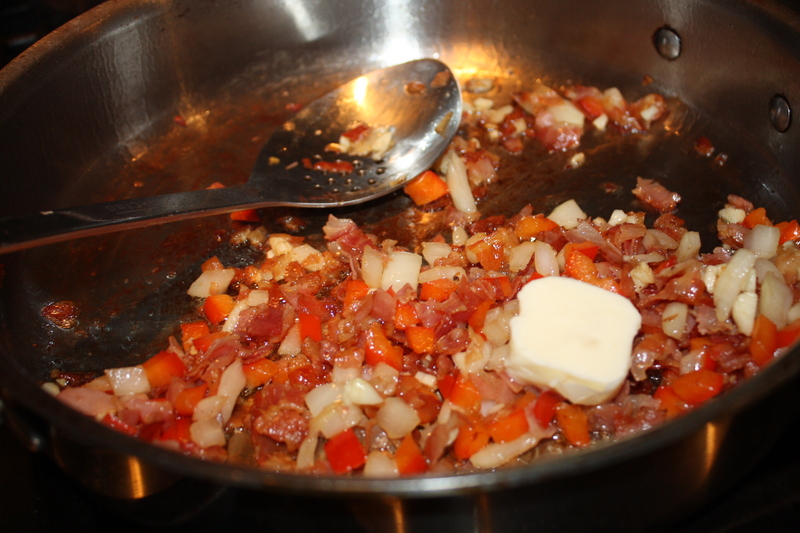 Add garlic and butter and continue to saute for about 1 minute. Add white wine to deglaze pan. Immediately add spinach and stir until it has wilted. 3. Meanwhile, in a med sauce pan, bring about 6 cups of water to a boil. Add a generous pinch of salt and cook orzo according to package instructions. 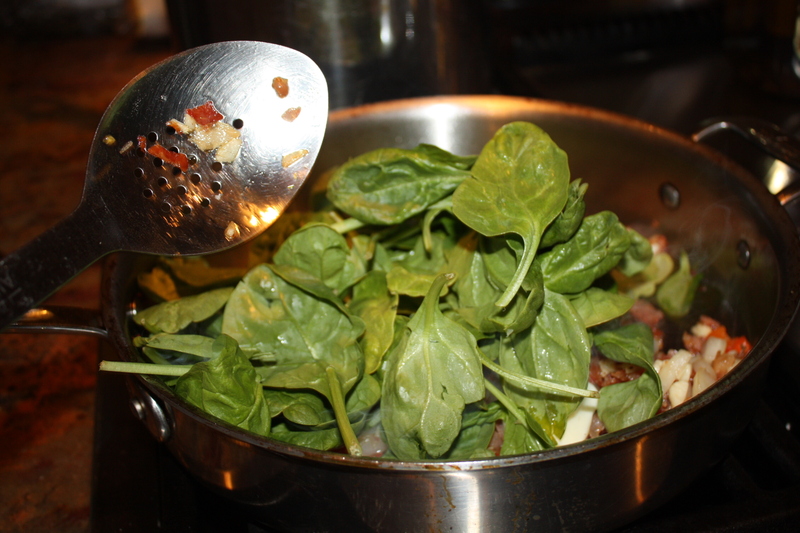 Once cooked, drain and add to spinach mixture and saute for a few minutes. Add drizzle of white truffle oil, salt and pepper to taste. Add freshly grated parmesan cheese once you serve. This is one of my favorite pastas! I have been preparing it for soooo long, I think I can make it with my eyes closed by now. 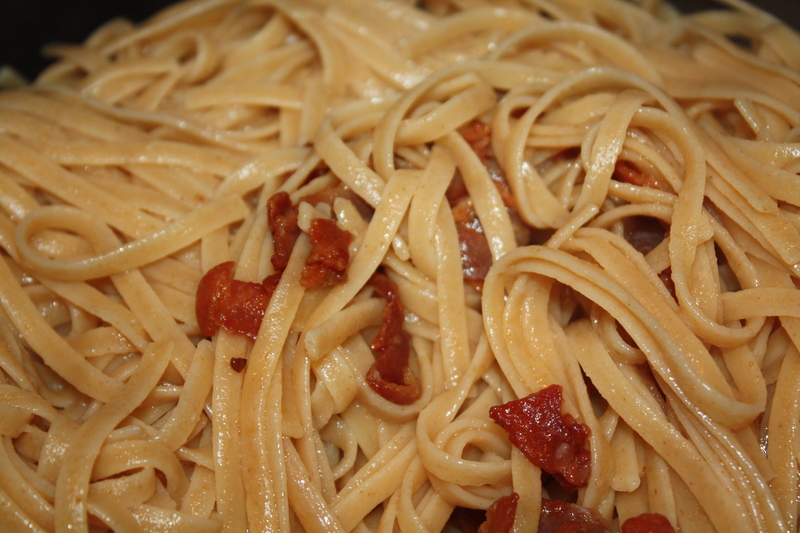 Linguine alla Carbonara is easy to prepare but must be eaten immediately! Make sure you have all the side dishes ready and served when you prepare it so that you can eat it hot. If you can, heat the serving plates a little before serving. Pancetta and pecorino cheese are very savory so no salt needs to be added. I use whole wheat pasta and organic eggs when possible. Last week, while I was in Miami, I invited over for dinner my good friend from college, Axel, who lives there. 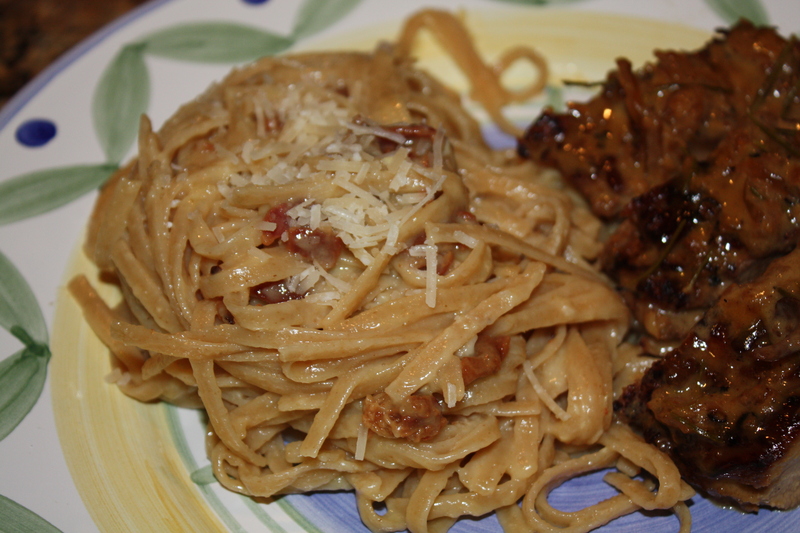 I made the Brown Sugar Pork Tenderloins with this pasta and the reviews were fabulous! This recipe is the traditional way to make it (eggs, pancetta and cheese), but there are many variations. I never order this dish when dining out because you never know what you are going to get. Some restaurants make it with cream sauce, I guess because 1. it is safer (it is risky eating raw eggs) 2. appearance (cream sauce just looks nicer and more appetizing) and 3. it is just plain easier. You may put the eggs in boiling water for a little less than a minute to reduce risk of bacteria. Immediately take them out and run them under cold water. Crack them and put them in a bowl and whisk together, then add cheese. One last thing, if you want to give it some color and a nice twist add sweet green peas. 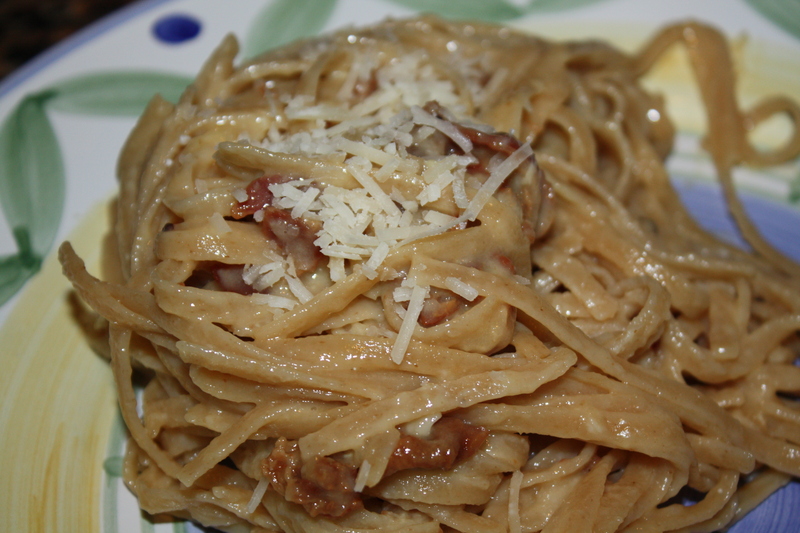 Here is my version of Linguine alla Carbonara. 1. Bring water to a boil in a large saucepan. Add salt and some olive oil. 2. 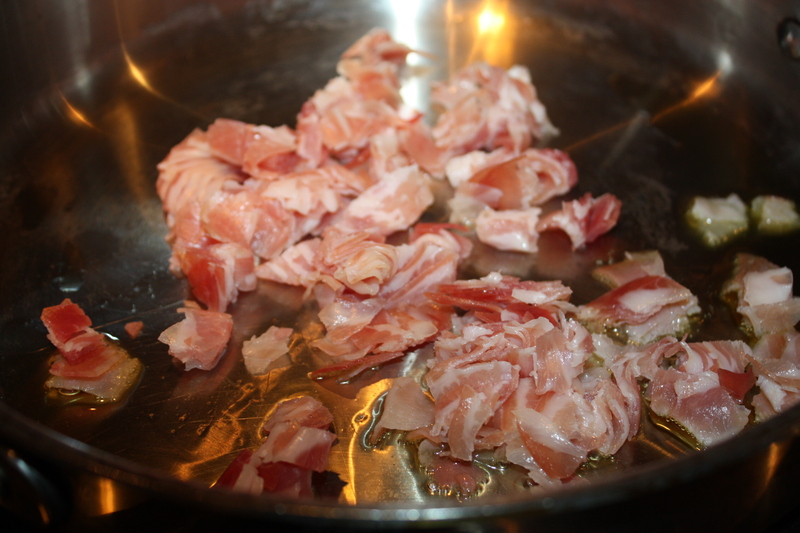 Add tbsp olive oil to skillet (medium-hi heat) and saute pancetta until golden brown (do not let it become too crispy). 3. Add pasta to boiling water. 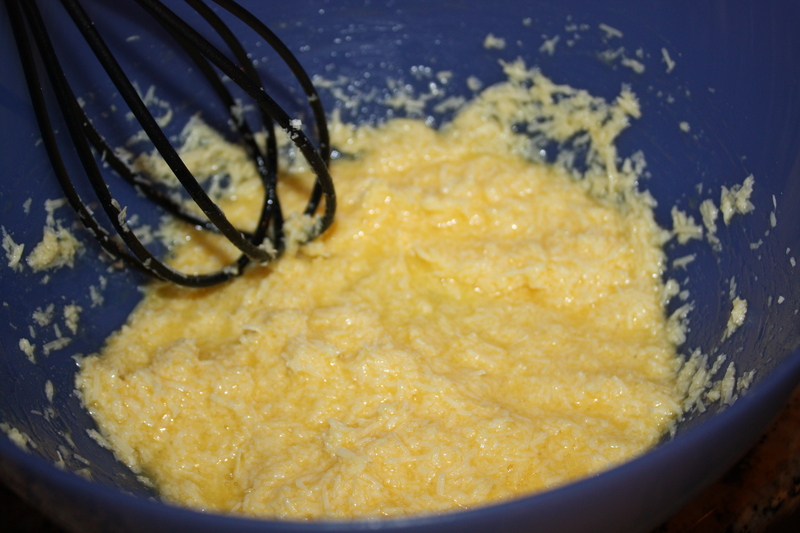 Meanwhile, beat eggs with a whisk and add cheese to create a lumpy mixture almost like yogurt. If it is too liquid, add more pecorino cheese. 4. Drain pasta and toss with pancetta (including fat) and butter. 5. 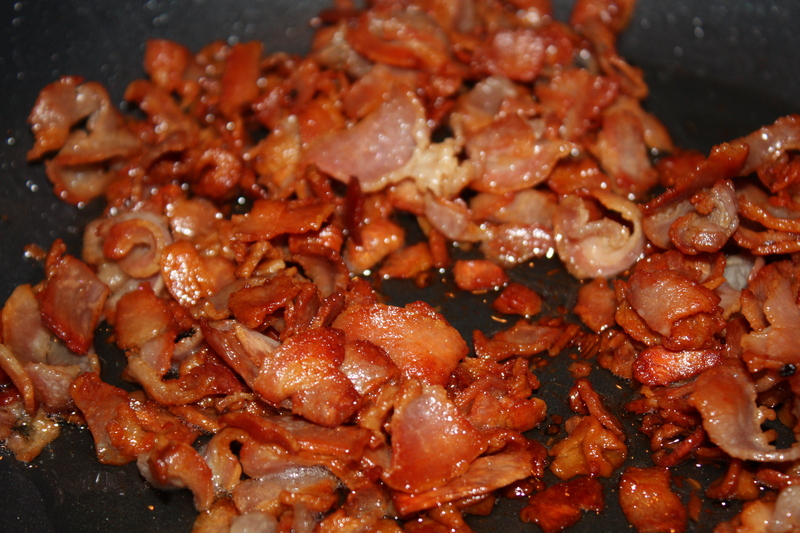 Immediately, add pasta and pancetta to egg/cheese mixture and toss to coat evenly. The hot pasta and pancetta will melt cheese and cook eggs. Add salt and pepper to taste. Serve at once.